How relevant is Gaelic to modern Scotland today? Chan eil aon chànan gu leòr. How many readers can understand this sentiment or indeed recognise the Gaelic phrase which aptly translates as one language is never enough? Sadly, or depending in the light in which one views Gaelic, it would seem one language in Scotland is indeed enough with just 1.1% of the population speaking Gaelic. 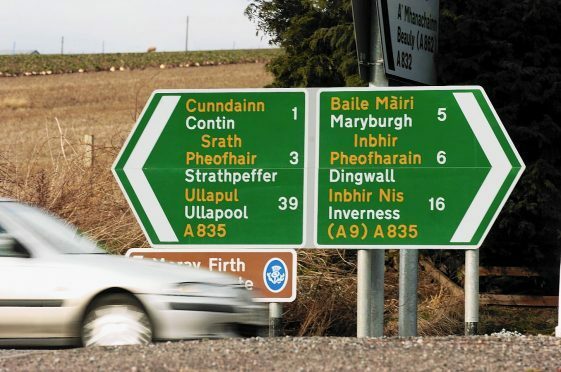 It is no secret that Gaelic has been in decline for many years despite road signs in the Highlands and islands and even in the north-east including the Gaelic place name. Classed as an indigenous language, it is believed Gaelic was brought to Scotland around the fourth or fifth century by settlers from Ireland, reaching its peak in 1018. Some historians pinpoint its decline to the reign of King Malcom Canmore, although his brother re-introduced the language when he inherited the throne. History aside, how relevant is Gaelic to modern Scotland today on both a social and economic level? Recent studies have shown a major shift in attitude during the past three decades, with people more open to learning the language and understanding its benefits. But Gaelic has also come under the spotlight in recent days after it was revealed that education chiefs in Aberdeenshire spent close to £40,000 a year sending seven pupils to Aberdeen to study Gaelic. Last year, £37,570 was spent on sending the pupils to Gilcomston School in Aberdeen for Gaelic medium education (GME), where primary-aged children are taught the curriculum in the traditional language. Under Scottish Government legislation, councils have to provide access to Gaelic education, and Aberdeen city council has set aside more than £300,000 for teaching Gaelic in Aberdeen schools this year. Is this money well spent preserving an important part of Scotland’s heritage or a waste of valuable resources? For Allan Campbell, who is president of An Comunn Gàidhealach, The Royal National MOD, Gaelic is an invaluable part of Scottish culture and he believes tides are turning for its popularity. The running of The Royal National MOD has supported the teaching, learning and use of the Gaelic language for more than 100 years and people travel from across Scotland to witness the event. The week-long festival will take place in Lochaber next month and it is expected to provide a major boost to the local economy, with thousands of visitors flooding in. “I have been involved with promoting Gaelic for the last 40 years and I think it is now recognised as a vibrant part of the Scottish economy,” said Allan, who lives in Inverness but grew up on Skye. “Julie Folwis, for example, is a very effective promotor of Gaelic, she’s an award-winning and renowned artist who sings primarily in Gaelic. “We are beginning to see some really positive change due to people embracing Gaelic but it hasn’t always been this way, the decline in Gaelic started many years ago. “Even when I was on Skye, the general attitude from older people was that Gaelic wouldn’t help you past Kyle of Localsh, it wasn’t seen as a useful tool to have. “People base their opinion on their own life experience at the time, Gaelic wasn’t valued the way it is now. Allan, who is also a former manager of the BBC, credits a resurgence in Gaelic to the number of young learners in schools and he believes the younger generation are key to the preservation of the language. “The hope for Gaelic lies entirely in the younger generation and there has been growth in the number of under 25s learning Gaelic,” he said. “It is a double-edged sword in a way though, because the more we succeed, the more we need to maintain the momentum and resources are limited. “One of the most important things for Gaelic is the motivation within communities and the realisation that the language is of real value both economically and socially. “Gaelic has endured a lot of negative attacks, especially in the media from time to time, and that can actually be pretty hard to take. “Imagine seeing your first language come under fire, because that is what the experience is like for some people and you have to build the confidence to survive that. For Scottish language enthusiast and entertainer Robert Lovie, children in Aberdeenshire would be much better served by learning Doric as opposed to Gaelic, though. He believes far more people are familiar with Doric, which refers to the language spoken in the north-east, and would like to see more resources targeted at the traditional dialect. “I’m not bashing Gaelic, I think it is a wonderful language and I only wish I could speak it, as many of my friends speak Gaelic,” said Robert. “I believe there are other languages such as Doric which really need our help, though, and Gaelic has already had a great deal of money thrown at it from European to Scottish government grants. “From Murray to Angus, Doric is still widely spoken and it incredibly distinct with very rounded vowels. Robert believes Doric could be incorporated into the education system, only then does he think that young people will take it more “seriously” as a language in its own right. “I think youngsters will realise that they have a wonderful language at their fingertips if it is actually taught and therefore respected in schools,” said Robert. “It’s not slang, and although people in the north-east tend to speak very fast, the pronunciation is actually beautiful. “Doric represents Aberdeenshire, it embodies its castles, farming and fishing and I think a lot of people would support Doric getting taught here rather than Gaelic. The very heart of Gaelic perhaps beats strongest in the Outer Hebrides, where it is still widely spoken on Lewis and Harris. Indeed Lewis and Harris is home to a unique form of psalm singing known as precenting, and religious tradition means many residents still adhere to strict rules on a Sunday –including not hanging their washing out. For business owner and Glaswegian Jamie McGowan, who moved to Harris to run a hotel, Gaelic is entrenched in his products and even family life. He has recently rebranded his candle-making business and changed the name from Buth Bheag, which means small shop in Gaelic, to Essence of Harris. “We partly took that decision because many people from further afield didn’t know what the words actually meant, but the history of Harris and Gaelic is entwined in who we are,” said Jamie. “We still want the elements of the island to be part of the business and that includes Gaelic. “It’s normal to hear Gaelic spoken on the island and my wife speaks the language. Studies have also shown that parents could be play a key role in the resurgence of Gaelic, by supporting their children in learning the language. Research led by the university of Strathclyde found that as much value was placed on the value of Gaelic by speakers as by non-speakers, demonstrating a major change in attitude over the past 30 years. The speaking of what is essentially a minority language is no longer frowned up, and Doctor Fraser Lauchlan, who led the study, believes the shift may be down to economic benefits. “Attitudes towards languages, particularly minority languages, can be influenced by factors such as the increased economic and social opportunities that they might offer, the general levels of confidence about a language’s value and the diversity of contexts in which it might be spoken,” he said. “Previous research from more than two decades ago found that there was almost a level of embarrassment about speaking such languages and they were discouraged for many years. “It may be parents who hold the key regarding how a minority language is promoted. “If parents have a positive attitude, it could be a first step towards a language’s increased use within the home, and this in turn could have a positive impact on the practice of the language in wider society.